Hemingways is so beautiful that we decided not to do a real early start so we could just relax and enjoy before going to an ATM and the grocery and then off to Daphne Sheldricks Elephant Orphange. Started many years ago, this project rescues baby elephants for return to the wild. There were 27 babies today….the most I’ve ever seen at one time. I usually "adopt" an Ellie every year and was going to do so in person at Daphne’s instead of online. However, have I mentioned that it is COLD in Nairobi…I mean really cold at night and early am…..very unusual. 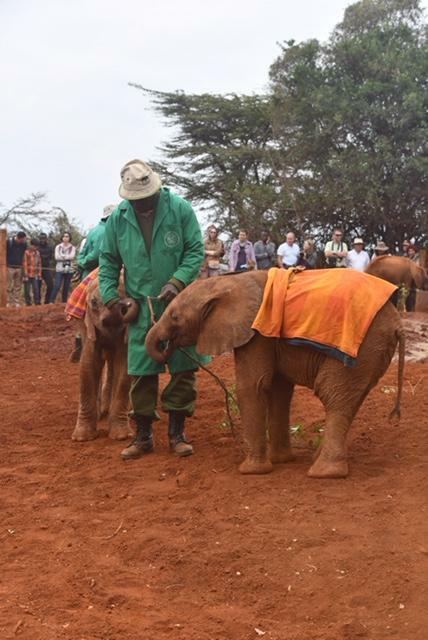 So I supported the ellies by purchasing a nice, warm, thick fleece jacket. After dropping some companions off at Giraffe Manor, where the giraffes stick their heads in your window, I went back to my hotel for an afternoon of leisure, etc. I had planned on a dinner of soup and creme brûlée, but realized this would be the last chance for a real shower and enough water pressure to wash my hair….thus my dinner was a candy bar from the mini bar…..now that’s decadence! Watched election and North Korea news. Geez, I’m very glad to be heading out into the bush! In the picture, it’s interesting that each keeper stays with his baby for 24/7 until they are released into the wild many years later.